Coming 7/26/11 from Inception Media Group is a new cult film which takes two of my favorite genres (Zombies and Westerns), throws them in a mixer and crafts a delicious brew of violence, action, gore and everything else you'd hope for. The film is called The Dead and the Damned and was directed by newcomer Rene Perez. The Dead and the Damned starts off in a small town in California 1849. A bounty hunter named Mortimer (David A. Lockhart) is trying to capture an Indian named Brother Wolf (Rick Mora) for an unknown reason and buys a beautiful young woman (Camille Montgomery) to use as bait. After heading off on his quest, the small town of miners find a mysterious, glowing rock. Thinking it might be filled with emeralds, they decide to break it open with a pick axe. The rock turns out to be a meteorite and it unleashes a green gas turning the town folk into the undead. After capturing Brother Wolf, the trio find themselves stalked by the zombies and have no choice but to band together to survive. 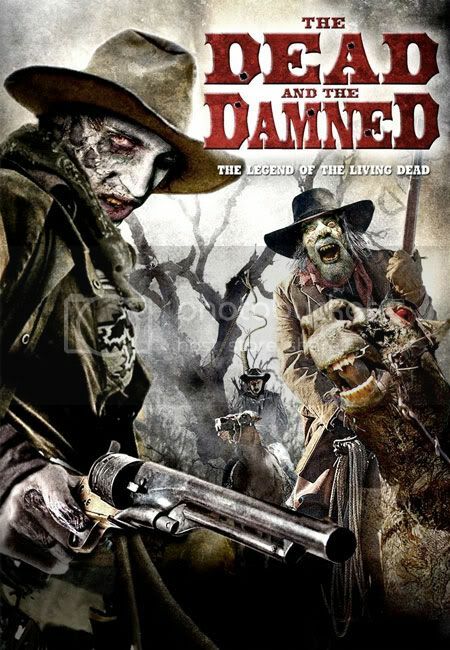 The Dead and the Damned does a great job of mixing two contrasting genres into one fun, action-packed romp. The zombies look great and the Western settings/costumes are well done. Even with a running time under 90 minutes, the simple story had a few nice twists and turns but it could have been filled out a little (there are several long stretches with just music and the characters walking around). Other than that I have no gripes with this movie. The CGI gore FX are surprisingly good (considering CGI is my kryptonite) and the acting is also convincing. For a low budget horror/action film, this one stands out above the rest of the seemingly endless DTV garbage being released today.